The Rebel Sweetheart. 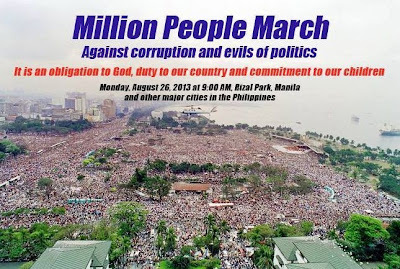 : Wordless Wednesday #52 | Million People March. I was there. Good thing the weather was cooperative. It was the first time I joined a rally like that, and I must say, it felt good to be part of history- even for a brief moment. The Million Peopla March is good for democracy and I hope that pork would completely be abolished. I hope they get somewhere! Wow, talk about support! Happy WW! Oh goodness! No way! That is the scariest Miss Piggy I've ever seen! Those are amazing pictures, especially the first--just breathtaking. So many people coming together to march against corruption in their government. I truly wish we could get an overview shot of that many people uniting together against the corruption in the US. i hope after this the government will do something about this! Nakakapanghina ang katiwalian! Yes I do hope the government will take action. I was not able to participate at the Million People March here at our place though. 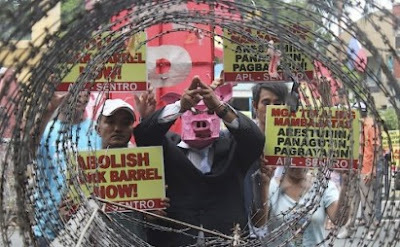 the unity of filipinos always give me goosebumps! yet i have not participated yet in any..
WOW! That is a lot of people supporting a cause!